Yukihiro Taguchi, artist and recent winner of the International Art Triennale organized by the Osaka University of Arts, tells TAB about the concepts behind his singular works and inspirations that keep sustaining his artistic activities. Taguchi’s bold interventions on the elements that we ordinarily disregard because of their ubiquity, such as the air or the ground, engender a subtle but profound new awareness of the various relationships that construct what we experience as everyday life. The relationship between all things is in fact the cardinal interest of the artist who describes his role as a kuroko (a stagehand in Japanese theatre who dresses completely in black so to be ‘invisible’ to the audience) who merely prepares the stage for the viewers, the participants, to rediscover existing relationships or to start constructing new ones. TAB found some time to talk to him before his busy trip to Japan where he’ll be presenting his works at several events. Since you were an art student your chosen modes of expression have been performance and installation. What was the reason behind this decision, or the development that brought you to it? During my university years at the Tokyo National University of Fine Arts I didn’t paint much despite being enrolled in the Oil Painting Course. At the first ever class there, we were given the task to think about the environment and place. In other words, we were forced to think about what expression and representation is and more specifically why we were choosing the act of painting with oil paints on top of a canvas as our mode of expression. In fact at the time, I regarded the fact that I was painting and that I would continue to do so in my university years as self-evident. But then I was prompted to consider why I was expressing myself using this specific medium. With these questions in mind, I would construct frames to which I would then stretch and fix canvases onto in order to paint, until one day a new set of questions arose, namely the point where the production process begins. I found it increasingly difficult to see the boundary between the act of painting onto a canvas with a brush and the act of preparing that canvas: they both seemed a part of one process. To put it more simply I began to be fascinated by the very act of stretching and fixing canvases. In order to achieve a flat surface you have to exert a strong tension in the canvas that is then fixed in the four corners. 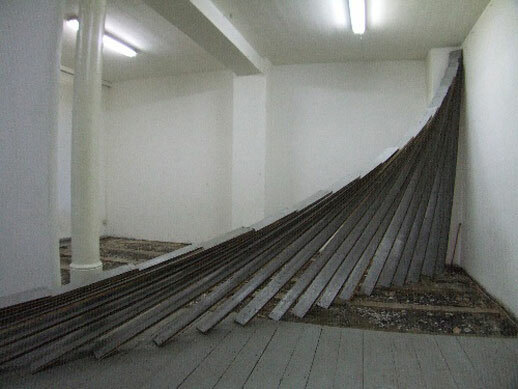 I began to explore in my mind the possibility of making the tension itself the concept of a work and this subsequently developed into installations and performances. It all began with painting. So we shouldn’t understand it as a reaction against more commercial or traditional forms of art. Right, it wasn’t a reaction to something; it was more a natural flow of events. The starting point you just mentioned, tension, can be directly linked to the concept for the performance/video work Tension you’ve submitted to your university as a “self portrait”. Here your current interest in the relationship between body, consciousness and the elements that are crucial for the body such as the ground is already strongly present. This has developed into works such as Gift where you concentrated on the air we breathe. Could you talk a little about this series? In Gift I simply directed my attention to an element we normally do not take into account: air. It’s like with the ground, I don’t think anyone consciously thinks about the fact that one is standing on the ground. Similarly I don’t think people consciously think about the air they’re constantly breathing. It is a crucial factor for us but we forget about it or rather ignore it in everyday life. 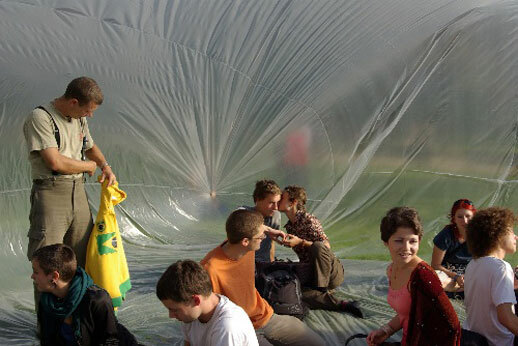 These installations and performances were an attempt to reconfirm the presence of air. ‘Gift’ in English means a present but in German it means poison. Too much air, too much oxygen is actually poisonous to the body. The air we’re breathing now has a perfect balance for us with a little bit of CO2 and little bit of O2 and so on, and I believe that such a condition itself is a gift. So what I attempted to do with the first Gift performance for which I went to a park and I asked people to breathe into a plastic bag which covered my head, was to emphasize the sense of being provided with something, being given something, by creating a situation where one can’t breathe air in any ordinary way. 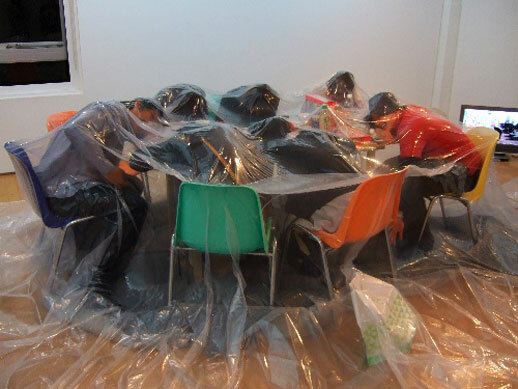 This is the same with the later projects where I sucked up the air with a vacuum cleaner from the space covered in a plastic sheet in which people were sitting. 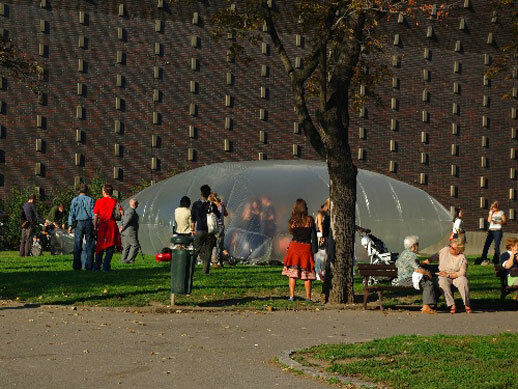 The larger scale installation/performances Giftplatz that you’ve been presenting recently in various places including Berlin, Prague and Sarajevo emphasize the presence of air even more strongly. 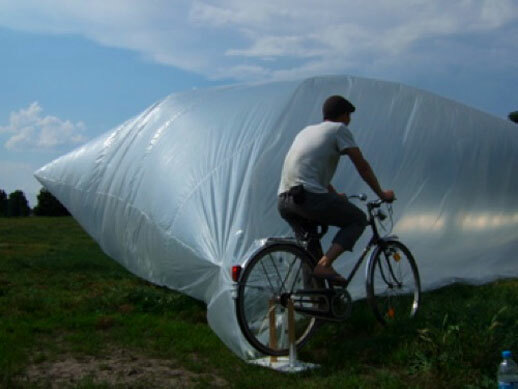 You’re constantly pedaling a bicycle to send air into the plastic sheet spaces right? Yes. What’s interesting about those bicycle ones is that once people go into the space and start talking to each other they immediately forget that outside that space I continue to pedal on the bicycle to send air into the space. They become absorbed in the conversations and forget about my presence. That is a condition which is very similar to our everyday life but the moment they shift their gaze, they realize that there’s this guy who’s constantly working to produce air for them. You mentioned the element of the ground. The work that won you the Grand Prix at the International Art Triennale organized by the Osaka University of Arts, Moment, focuses exactly on this. Could you talk about this work? The title Moment comes from the fact that the time we live in is constructed by the accumulation of instances we experience in everyday life where we may meet people, have a cup of tea or cook in the kitchen. Instances that may not even have a meaning. Or rather things in which we’re unable to find any meaning, or even just things that may interest us or things that in artistic terms we may even call beauty, and yet despite the fact that they are clearly there, we’re just unable to see them. Moment was an attempt to find this. 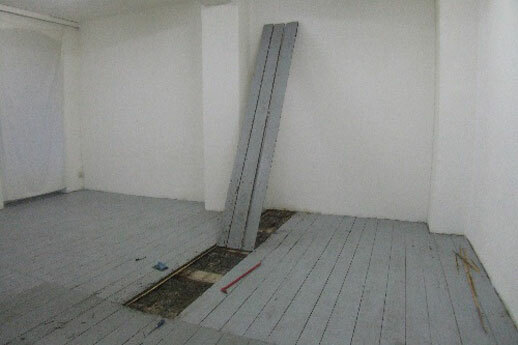 The act of stripping off the floorboards was just an attempt to instigate new discoveries by presenting those boards in unusual positions and situations. I think it’s rather rare to see the floor which we normally walk on to be standing right in front you, right? This is something I’ve been interested since I was an art student where I worked with carpets and it directly connects with later works such as Auf. The ordinary idea of a carpet someone has is bound with the image of it being on the ground. My first impulse was the curiosity to see these carpets in a different position. To see the floor in a different context. 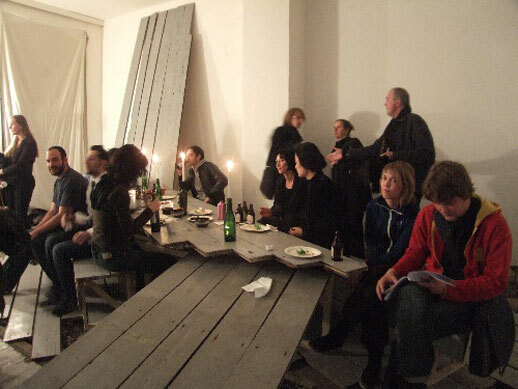 Just like in Giftplatz, another important element of this work is the fact that the floorboards turn into tables or long chairs for people to sit and watch films creating a situation where people are naturally drawn to gather together. Yes. It’s all about relationships basically, between things and people, people and people and so on. I haven’t published it anywhere else but I do have a concept which guides all my artistic activity regardless on the material I’m using or the context I’m presenting the work: “to intentionally induce spontaneously-generated relationships that emerge between all things”. The performance/video work Visitor that you created in Sarajevo this year focuses exactly on this element of relationships. When one thinks of Sarajevo, war is the first image that comes to mind and you do talk a lot about this in your blog as well. Your works however never touched on this directly. Why is that? The problem of war is a highly complex one which can easily also become a stereotypical one. I have a feeling that elements that are external to the work would overwhelm the work itself if I chose to make war itself the theme of the work. I just find it extremely difficult to work in that kind of way. I do want to deal with these large issues but I want to begin by focusing on the smaller issues. My idea in Sarajevo was to create a small community. All I wanted was that the local people, children and anyone that may be interested to come and gather together. When people get together you have to talk to them whether you want it or not and those communications certainly make me think and I hope they will stir up new discoveries in the visitors too. I’d like to ask you about the production process. Where does inspiration arise? I guess that in your case it will be more in the chance events in the everyday life rather than in the inspiration you get from other artists or ones you get by enclosing yourself in a studio. Yes, for me a studio is there solely for the purpose of operation and production. It’s not a place to think. For example, I always go to see a space where I’ll be exhibiting before I install the work or even start thinking about the work. It was the same when I did Moment. I went to the gallery space and I carefully observed all the elements of the space, from the quality of the walls and floorboards to the size of the space, thinking about what would be interesting to present in this space. Any space has its peculiarity, its character, and I therefore concentrate first on trying to identify them. It often happens that an artist may find in a gallery space an object that he finds obtrusive to the work but which cannot be removed. On the contrary, for me those objects become the constitutive element that create the singularity of the space and therefore I think about how to use that object in my work, about what kind of new unexpected relationships it can help to create. Otherwise inspiration comes really from when I’m just talking to friends or walking down the street. For the last two years I haven’t been to that many art exhibitions apart from those of friends. The fact that my ideas are born in the context of everyday life is not only because I find it easier to work that way, but also because I believe it facilitates the viewer’s experience of my works. We are all human beings and despite the differences in lifestyles and so on, at the basic level we’re all the same: we all stand on the ground, we breathe air, we eat, sleep and meet other people. I feel that if I can find something meaningful in this I can create something that people can identify themselves with. The fact that you’re working with elements that are fundamentally shared across different cultures must have facilitated the understanding of your works by an audience which comes from a different cultural background from yours here in Berlin. What was the reason that pushed you to leave Japan and did the life in Berlin cause any significant changes to your work? While I was in graduate school in Japan I slowly nurtured a desire to move outside Japan and as I was traveling through America and then Europe I was simply overcome by the curiosity of what it would be like to work in such a context. Also, just from looking at the art scene outside Japan it seemed easier to present works than in Japan. So I decided to take on this challenge. Since I got to Berlin I have a lot more meaningless time, or rather time where I have nothing to do and therefore I end up thinking and working on the production of my works. It’s a place that naturally provides me with that kind of time frame. Of course the fact that I came over here with the specific aim to produce art works is a further incentive to concentrate on working. I don’t know, it’s hard to say what specifically has changed, but there definitely has been a change. Are you viewed as a Japanese artist here in Europe? Are you seen in the context of the now fashionable art that packages Japanese culture in a clear-cut easy-to-understand way? Of course there are people who view my work outside any of those prejudices, but I must say that is often the case. It’s fine if the concept of the work comes first and I’m invited to an event as an artist who creates works of this and that kind of concept. However I’ve for instance taken part in several exhibitions this year where the primary purpose was to present Japanese culture to a western audience. I don’t think I can’t keep on doing this because all the works in these exhibitions ultimately lead to the primary aim of the exhibition: “ah, that’s how a Japanese artist thinks!”. I don’t want to go there. It’s such a restricted sphere which I find extremely boring. I do partially understand the people who organize these events but I would find it hard to say exactly how meaningful they are. Sometimes they just make me think the sole purpose is to make a bit of money. What kind of projects do you have in mind for the future? It’s hard to say in any specific way at the moment, but this year I have been given several chances to present my works in Japan and I hope this will be a good beginning to start expanding the sphere of my activities outside Berlin and Germany. That’s one of the interesting points about Europe: anywhere can be reached over ground. Although I should say that I wouldn’t make that my primary aim. Rather, I want to intentionally act so that the occasions for me to present my works in different places will naturally and spontaneously arise. Maybe that’s an integral part of my works.